A top-quality, all-around table for art, design, crafting and other hobbies, Martin's Gallery Art and Drafting Table is set apart by its full-length storage shelf for holding supplies, papers, and books at your fingertips. The open wire construction of the shelf allows air to circulate and prevents debris from building up over time. 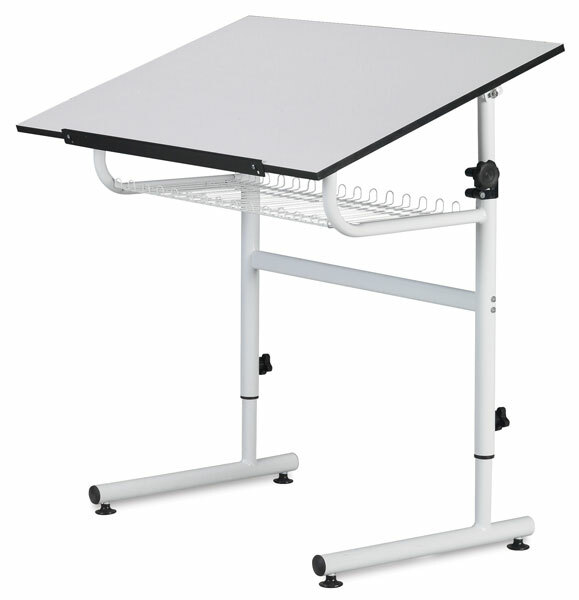 The 35½" W × 23½" D white melamine tabletop includes a pencil ledge and is adjustable in both height (from 28½" to 35½") and tilt (from 0 to 40 degrees). The steel frame has a chip-resistant, white powder-coated finish and levelers to accommodate uneven floor surfaces.